Looking up at the beautifully painted ceiling of the restaurant at the Ritz, and the eight gilded chandeliers that are connected by garlands of flowers in gilt bronze, we couldn’t help wondering if the Barclay twins, who own it, ever have nightmares about decorating it. As one-time painters and decorators could they ever have imagined that they would end up owning perhaps the most famous hotel in the world created by the greatest hotelier in history? Well, apparently, yes! 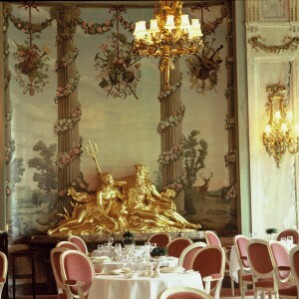 Many years before they bought the Ritz, they were having lunch there with their mother and they told her that they would like to own it one day. Their mother, who ran a confectionary shop in West London, must have laughed and told them they would never be rich enough. So much for mother’s advice! They bought the hotel in 1995 for around $135 million! At the time the hotel was not in the best of condition. In fact it was rather tatty. Now, eleven years later, with the Ritz in the middle of a host of centenary celebrations, thanks to the Barclay brothers and their millions the Ritz is more like its old self and Cesar Ritz himself would be as proud of it now as he was when it was built in 1906. And that is the remarkable thing about the Ritz. So much of it remains untouched. The stunning, stone staircase, the Grand Gallery, the Palm Court, the Restaurant and the Marie Antoinette Room for private dining are more or less as the original architects planned them. The Louis Seize panelling, marble fireplaces and fantastic gilt-bronze light fittings are there too, along with many of the clocks and even the old copper coal-scuttles that kept the fires stoked. Sadly the original Edwardian bathrooms have gone – but only just. They were still there in the 1980s! Back in the restaurant we were shown to our table where a marble buffet with a gilded life-size figure of Old Father Thames, and the beautiful naked figure of Ocean, graces one end of the room. Norwegian pink marble columns reach up to the ceiling. Below stairs in the kitchen we knew that Executive Chef John Williams was hard at work. He is a stickler for detail and is arranging a variety of celebratory dinners throughout the year. He had invited us down to see his kitchen at work and it was quite a treat. He pays homage to the likes of Escoffier, who, he believes, set the ground rules for the very best of cooking and who worked with Ritz himself. So he looked back at all the old menus and recipes and was so taken with them that he decided to cook a lot of today’s dishes in exactly the same way, albeit serving smaller portions than might have been brought to the tables a century ago. “We like to think that as you step into the dining room and eat here at the Ritz you could be stepping back a hundred years,” John Williams told us. Our dinner was served in grand style from silver salvers which had their lids theatrically removed by a bevy of waiters who looked after us like mother hens. We had the caviar and lobster á l’Americaine, a fillet of beef with foie gras and then a soufflé Rothschild, which seemed to be the perfect pudding for our surroundings. And, just for a moment, as we sipped our glasses of Chateau Lafon, we could have sworn the great man himself was circling the tables. 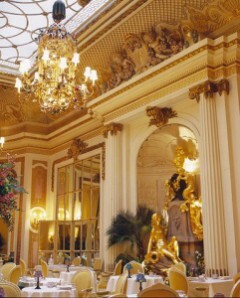 Afternoon tea at the Ritz has been in great demand since the hotel first opened. So much so there are sittings from 11.30 through until 5.30pm! It is served in the Palm Court, in silver tea pots with silver milk jugs and tea strainers. There is a choice of some seventeen teas with freshly cut sandwiches, raisin and apple scones with strawberry jam and clotted cream, pastries and cakes. While at 7.30pm champagne tea is served. Afternoon tea costs around $50. 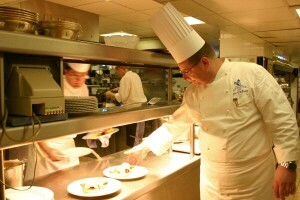 When it comes to lunch and dinner in the talented hands of Executive Chef John Williams he oversees fifty four chefs. His emphasis is on seasonal cooking using the finest British ingredients whenever possible. Game, especially partridge and mallard, are favourite dishes. Guest chefs such as Anthony Bourdain and Jacques Chibois will be joining him to cook and take part in the celebrations. You won’t be disappointed! Guests at the Ritz are being invited to share in the festivities throughout the year with a special room package. Prices start from around $2500 for two nights and include airport or station transfers in the Ritz's new 2006 Rolls Royce Phantom, complimentary membership to the Ritz Club, a night at the theatre to a London production of your choice; dinner in the Ritz Restaurant and a centenary gift to commemorate your stay. Otherwise ask for room rates without the package. Gentlemen will go no further than the lobby at the Ritz without a jacket and tie, while jeans and trainers are simply not allowed! On landing at Heathrow or Gatwick Airports, take the Heathrow or Gatwick Express into central London. Then take a taxi to the Ritz. 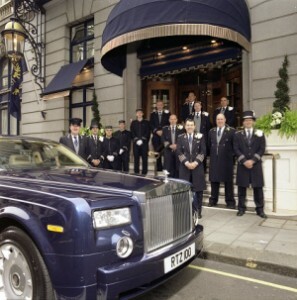 If you have booked a Ritz package you may be eligible for the Ritz Rolls Royce to collect you and whisk you to the hotel! Why not! Tired of lugging your bags and cases around airports and struggling in and out of taxis with it? The smart way would be to send it on ahead. Carry My Luggage will do just that. It’s a British firm based in Lincolnshire, England and it really is very simple. A couple of days before you travel they’ll pick it up from your front door and send it on to the hotel or destination you are travelling to.